● Visit the Clearance page to view the latest discounts on featured items, often over 75%. 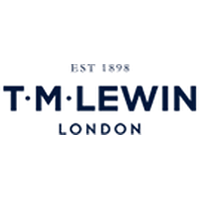 ● Join the TM Lewin mailing list to receive a 10% off on your first online order, and exclusive updates on new products and offers. ● TM Lewin has a No Quibble Guarantee allowing customers to return their orders within 90 days and get an exchange or full refund. T.M. Lewin as a name has been in business for well over a century. In the present, their website offers a range of apparel options and additional accessories for both men and women. You can check out the new section of the site to see items that have just arrived, or you can focus your search for the ideal item or wardrobe on specific sections of the site. T.M. Lewin offers a range of shirts, suits, casualwear items, ties, accessories, and more. For women, you can browse an assortment of shirts and suits. You can also use the website to focus your search according to the type of occasion you're shopping for. For most up to date offers check out TM Lewin on Facebook and Twitter or contact TM Lewin Support for any questions.